Later this month there’s going to be another round of shows to raise money to help with Cleve’s medical expenses related to his oral cancer therapy. First up, the Alabama Jazz Hall of Fame is hosting a benefit at the Carver Theatre on May 24. This evening of extraordinary jazz is headlined by the 18 piece Tommy Stewart Orchestra. Cleve is scheduled to perform, and there’s going to be a jam session open to all musicians. Interestingly enough, this is the first time that the Alabama Jazz Hall of Fame has had the opportunity, or cause, to do this type of benefit for a living member. You will not be disappointed by this caliber of performance. On May 28 head over to Ona’s Music Room for another performance benefiting Cleve with drink specials and appearances by Eric Essix as well as other local jazz talents. 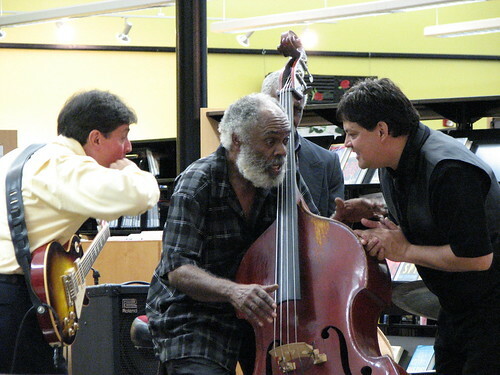 Photo: Jazz Bassist Cleve Eaton (center) and the Alabama All-Stars. bpl/Flickr. There is going to be a benefit concert for local jazz musician Cleveland Eaton at the Open Door Cafe tomorrow starting at 2 p.m. A $20 donation goes to a fund to help Cleve with medical expenses related to oral cancer therapy. This is a small price to pay to help a local legend. You’ll be compensated for your donation with a barbeque chicken dinner and performances by a host of musicians including Cleve later that evening. If you’ve never been to the Open Door and heard Cleve, Tommy, and John play for Jazzta night, this will be a perfect introduction to the cafe and Birmingham jazz. Leave a comment letting me know if you decide to go, and as always if you’ve got other plans let the rest of us know what your doing this weekend.